Character development, Ethics, is a Mission Skill and a focus for us at The Lexington School. In an environment where teachers and kids have trust, there is plenty of room for teaching ethics, empathy, and sensitivity to others. Chuck Baldecchi, Head of School, shares a teaching moment in his most recent monthly letter to The Lexington School’s parents. Before the presentation began, the 2X4 piece of wood was smooth and unblemished. Now, it lay on the bench with five nails in it. Each nail represented the hurtful comments hurled by the “bully” in this well-thought-out skit developed by the three faculty members whose job it is to help various students deal with the ugly words said or the sense of insecurity a child might feel or the everyday slights one may endure because of race, religion, gender, personal appearance, or sexual orientation. The phenomenon of kids behaving ignorantly, thoughtlessly, and cruelly to one another is as timeless as adolescence itself. Each of us can think of a time we were teased, humiliated, or felt bullied. If we are honest with ourselves, we can remember the times we teased or how we humiliated a peer or came down hard on a classmate who, regardless of the situation, should not have received such poor treatment. After each of the phrases stated above, the uncomfortable silence among those in the assembly was broken by the narrator with, “Stop, That’s Not Okay!” By the final example, the entire audience of students was responding with a deafening, “That’s Not Okay!” Next, one of the facilitators asked why each of the above lines wasn’t okay. Some were obvious or explicit, while others were implicit. All were hurtful. In the skit, the “bully” then apologized to the victim—a genuine apology. Continuing with the metaphor, the person at the bench who hammered each nail set about the task of pulling out the nail. Some were harder than others to extract; some were deeper than others. All left a mark—a wound on the now blemished 2×4. You could feel the holes. You could see the damage. Some people don’t have fond memories of middle school. I find the rawness is still there for some adults. Teaching our students to effectively navigate this time in life is critical to each one’s success and well-being. The Lexington School has the staff to help your child navigate this intense period of identity. If you work with adolescents, you see it in real time. They change personalities like clothes and try on different personas. This is why you hear experts in this area make distinctions between “bullying” and “unkindness.” Virtually every kid is unkind at one point, but only a rare few are what I would consider bullies. It is relatively common for a parent to walk into a Division Head’s office and demand that “that bully” be expelled for picking on my child. “I can’t believe TLS tolerates that kind of behavior,” is sometimes stated. Let me make this clear: TLS does not tolerate bullying. Bullying in my mind implies consistent behavior: one child is purposely targeting and mistreating another child again and again. Unkindness is a completely different story. A child can be unkind to another child one day and then can find himself the recipient of similar unkindness the next. A great school has both fantastic teachers to help set clear expectations of behavior and a diverse faculty with varied interests so that different students can find the right adult to talk with and discuss the trials and tribulations of adolescence with—Someone in addition to their parents. Who are these adults at TLS? Classroom Teachers: I always see the classroom teachers as the obvious first line of defense. 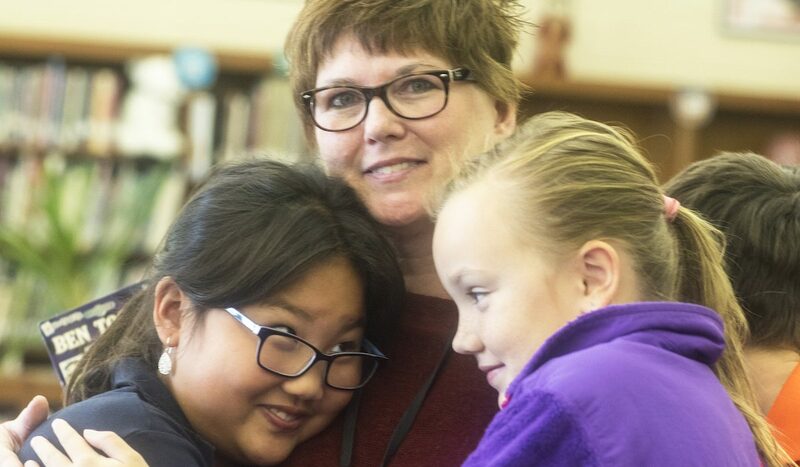 Our middle school students rave about their teachers and the strong sense of community at TLS. Each year the 8th graders write me a letter about what they hope never changes about TLS. These letters are filled with stories about how multiple faculty members and coaches changed their lives. It is so important for adolescents to have positive adult role models who are not their parents. Our faculty provides that need. Division Heads: Division Heads bring such wisdom to this important time. The value of being a good friend starts in Preschool and continues throughout the elementary and middle school years. Bringing kids together in order to “set the record straight” and identify the hurt words said and the pain those words caused is an important step toward the desired outcome of reconciliation. Most of the time, students work out their differences among themselves, but it takes the important work of the Division Head to get students past the hurt and anger to empathize with their classmate and leave as friends. The Professionals: The three faculty members who conducted the skit I reference at the beginning of the letter were Grace Newsome, the school’s counselor, Jami Ervin, current Director of Multicultural Affairs, and Andrew Schwartz, future Director of Multicultural Affairs. These adults are here to help and give their expertise. Grace Newsome joined TLS this fall as a full-time counselor. She meets with students individually to work through any issue they may have, and she is also here to facilitate various discussions among students, as well as deal with issues that may present themselves divisionally or across the grade level. She is an incredible resource; take advantage of her expertise. Jami Ervin has served the school as Director of Multicultural Affairs for two years now. Next year she is moving to Columbus, OH, and Andrew Schwartz will continue Mrs. Ervin’s work. TLS’s top strategic priority set out in its 2012 Strategic Plan is diversity. Mrs. Ervin and Mr. Schwartz help our students, faculty, and school community grow toward the school’s goal of becoming a more inclusive community regardless of one’s race, religion, sexual orientation, cultural, or economic background. Their perspective and insight is critical to the well-being of all students and TLS’s goal of truly becoming an inclusive community. Building community is our most important work at The Lexington School. Developing thoughtful, empathetic, kind students is at the core of building community. We take that responsibility very seriously at TLS and dedicate the time and resources to making it a reality. This summer I have asked Grace Newsome to develop a curriculum for our faculty to use while having these conversations about friendship, kindness, community, and, an ever present concern in today’s world, technology. TLS has invested a great deal in its Mission Skills. Thankfully, that program dovetails beautifully with character and friendship development. There is a lot of work to be done. While we are working toward our goal, this important work is one whose final goal is never fully achieved. For every human being, this is lifelong work.